I'm in the process of building the Nemet Lynx from the recent "Best of Vol3". I guess that with the original articles being published in 2006 any errors didn't make kit to the online forum, or the forum didn't exist back then..
Can't answer these questions never having built it or studied the drawings with a view to doing so . However the build up of the cam always seemed a bit of a kludge to me where everything had to be assembled inside a manhole and then the bearings fitted. It would have made more sense to have the drive side bearing large enough so an assembled / one piece camshaft could have been threaded in and then the bearing fitted. Food for though on a new build ? Pete, regarding the offset on the cam box which is 15mm deep, if you place the hole 8mm from one side as shown on the drawing it will offset it 0.5mm from centre line. So only the text is wrong. Where are you getting your 19mm between cam outer faces from or the 13 for that matter. I make it 21.5 by the time the spacer has been added between the two cam lobes, though 19 would suit the valve spacing better. There is a correct table for the cam cutting, on a previous thread on this web site. As to having to assemble tha cams inside the housing. As far as I know that is not correct, that is why the bearing outer diameter is as large as it is, so that the cams will pass through. Correct Cam cutting table is in the thread "Best of Model Engineer 3" on page 7 posting by Katy Purvis pdf's for down load by Jason Hope this helps. Thanks guys I think I have most of this covered off. I'll address each on in turn so it all here for others. It is possible to assemble the camshaft 'out of the (cam) box'. The cam blank is 12mm and this is machined down by 2mm to the base circle. So it ends up as 10mm to the lobe peak so will fit through the 10.5mm hole. BTW I did my hole 11mm which makes the bearing housing 11mm and a bit more robust when pressing in the bearings. Yes its the text I was commenting on. If the builder follows the text then the hole is 0.5mm too low and the cam will probably not be able to rotate. Got that thanks, and copied here to consolidate the data. On the missing cam data the direct link to the online copy of the original issue 4281 is on page 262 here. There was one other thing that isn't an error but a change that I've made to the design. I wasn't happy with the valve seats and tappets running directly in the aluminium head. Malcolm must have come to the same conclusion with the Bobcat/Jaguar as he has designed a bronze seat /guide. There is plenty of meat on the head of the Lynx to do the same so I've copied the combined seat/valve guide from the Bobcat (to Lynx dimensions). I've also made the counter bores for the tappets 11mm vs the 10mm in the drawing and pressed in bronze sleeves. I'll do some photos later as I'm working on the valves at the moment. Is there anything else not covered? They're made so the internal dimensions remain as the original design, there's plenty of room in the head to accommodate any suitable external dimensions you may choose. They are just pressed in. Take a look at Malcolm's Bobcat drawings and write up to get the idea. I've got one of those installed, I think it’s an inherent part of the design. In my case the feed tank may have run dry. I’ve now done this and the Bobcat, in both oil seems to come out of places you’d least expect. Today is strip down and see how much oil is actually left in the sump and how much there is in the silencer . The ignition seemed to work fine but I had starting problems on the Bobcat which I put down to being a first timer. Once I got it started it wouldn't rev as high as expected and the engine cut out. I put that down to the home made carb. On the Lynx I used a Walbro carb so didn't expect any running problems. I was wrong the performance was much the same. In order to understand the problem I hooked up with a group on the RCgroups.com forum who are in the process of producing a similar system to the RCexel but more flexible and with more features. To cut a long story short I've got involved in helping write the code for the PIC micro controller used in the system. 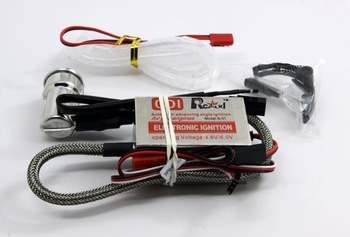 These ignitions use a micro controller to measure the time for each engine revolution and then apply the necessary advance to the spark dependent on the current RPM. I have realised that all the systems rely on the the hall switch being on the crankshaft, Both the Bobcat and Lynx have the sensor on the camshaft so the microcontoller always thinks the engine is going half the actual speed and applies the wrong advance for the revs the engine is doing.. Although the hall switch is set at the right firing point before TDC, it calculates the wrong delay and fires the engine late. So although its possible to get the engine to fire (with difficulty as I found) the engine is never running at its optimum and at some point in the rev range it just stops. If it works as planned the system we are doing on the RCgroups forum will be aware of the location of the hall switch (crank or cam) as well as enabling the user to configure their own advance curve for their engine. 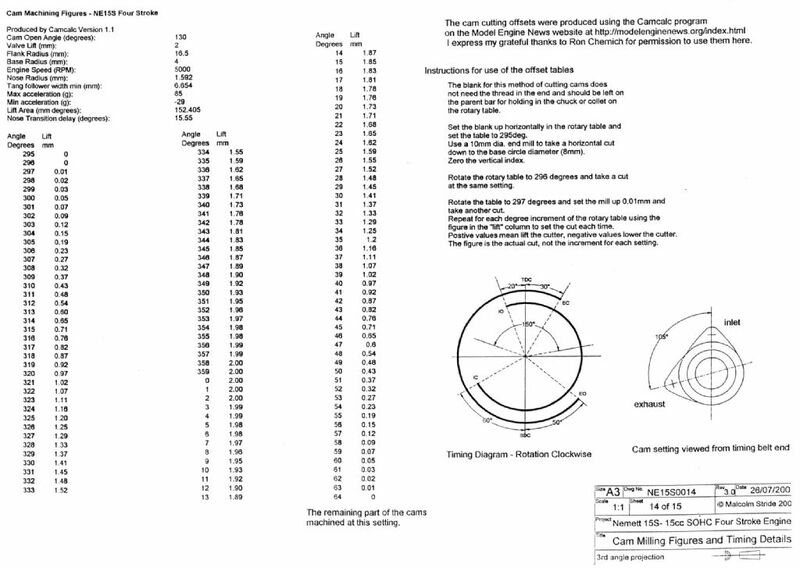 Hi bit late now but there are no errors in the cam box drawings from 2006, and there are no spacers on the cam shaft, the cams lobes are 6mm wide with bosses each side, one side 3.5mm wide the other 4.7 wide, the 3.5 bosses go together in the middle, this gives you your 13mm centres same as the valve centres, with the cams on there shaft the overall dimension is 28.4. the cambox is 45mm long with a 30mm long slot, 7.5mm each end, the bearing housings are 8mm wide therefore protrude .5mm either end into the 30mm slot, which will leave you with .6mm end float if your measurements are that accurate. The cambox is 15mm deep and the cam bearing holes offset towards the head by 1mm. Regards Alan. I agree the full set of drawings will be fine, I doubt if they would have been changed since 2006. The problem is a transcription error from the drawings to the magazine article in 2006. The cam box dimensions are all wrong. I only noticed it when a club member showed me the engine he had made from the 2006 articles. Something didn't seem right so I checked. There are also errors in the text that have been carried over to the 'Best of ME' edition. Just a case of builder be aware, and check when working on this part depending on your source of information. the cam box depth is 15mm and the offset is given as 8mm giving 0.5mm. But the text says 1mm as does Alan above. Can you clarify which is correct. If it is 1mm then the bearing housing is only 1.5mm from the head face. My drawings are rev 3 dated 26/7/2007 and show the offset as 8mm giving 0.5mm from ctr line. I must say your job is very impressive, I liked the video. Did you find that it used much oil and was that collected in the silencer. I have noted that very few small engines have oil control rings I am not sure why this is, perhaps it is to keep the piston short. Hi sorry I have lost the plot, Jason is correct, the offset is .5mm offset towards the head. Thanks for the conformation and appologies for the posting mixup.